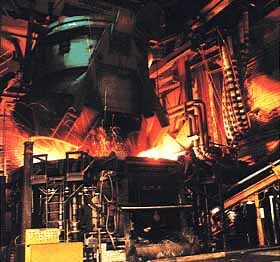 The electric are furnace (EAF) is the principle furnace type for the electric production of steel. The primary application of the EAF is for the remelting of steel scrap; however, EAFs can be charged with limited amounts of iron scrap, pig iron, and direct reduced iron. About 39% of total steel produced in the U.S. comes from EAFs in operations called minimills (see Overview: Minimill Business Structure). With 100% of the charge coming from scrap it is difficult to control the purity and quality of the steel produced, therefore, minimills centered on EAF steel production have concentrated on market segments where steel quality is not as critical.